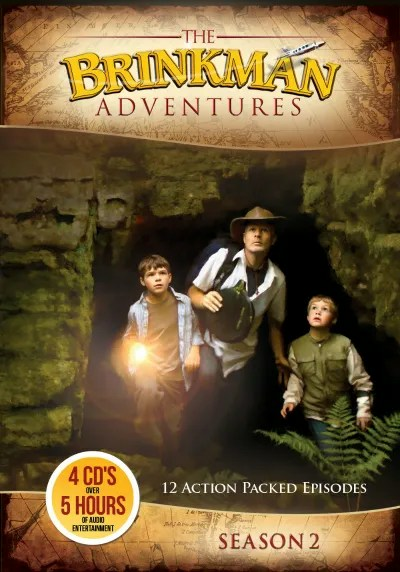 When I ordered some curriculum from My Father’s World last fall, a free CD was included that was the first four episodes of The Brinkman Adventures. Because we liked that CD, when I got the chance to review The Brinkman Adventures Season 2: Episodes 13-24, I was happy to oblige. The Brinkmans are a large missionary family. The children do their own voice work for the show, though actors do the work for the mother and father, Jack and Susan Brinkman. What Is the Brinkman Adventures About? The Brinkman Adventures is an audio drama series about the Brinkmans’ adventures as missionaries as well as the adventures of other missionaries that they know. For instance, season 2 delves into a man the Brinkmans meet, John Benti, and his missionary work in Hong Kong during a time when being a Christian there was dangerous. In fact, one woman that they meet longs for a Bible, so they create one for her by cutting pages out of 5 different Bibles and making a cover for the book out of a t-shirt. Who Is The Brinkman Adventures For? My three children, ages 4, 5, and 9 listened to The Brinkman Adventures. Bookworm (9) loved the stories and was very interested. PB & J Girl (5) and Cuddle Bug (4), listened for a bit, but weren’t as interested. I was glad for that later when topics such as international child slavery were tackled. What Is The Brinkman Adventures Format? Each episode runs 25:55 minutes. About halfway through the episode, there is a brief break when one of the Brinkman kids shares a Bible verse and encourages the children who are listening to tell others about Jesus. At the end of each show, there is a preview of the next show to come and a word of advice is offered to kids that are listening. At the end of one of the episodes, one of the kids explained how The Brinkman Adventures is made. She said it takes one full day to produce a 30 minute episode. She also explained how they write the script and plan for story ideas. Most of the stories are based on true events, though they are changed somewhat to protect the actual people in the stories. The Brinkman Adventures are available as a full 4 CD set (suggested donation of $25), or as an MP3 Album download (suggested donation of $17). The portion of the season we received included 12 episodes and over 5 hours of audio drama! We received the MP3 Album download. Overall, Bookworm and I loved The Brinkman Adventures. However, because we don’t have an MP3 player, we had to listen to them on my laptop. Even with the volume up all the way on my computer and the episodes, we sometimes had trouble hearing the story if it wasn’t quiet in the house. Bookworm also found some parts difficult to understand such as when the native Hong Kong residents or the very young Brinkman children were speaking. The website for The Brinkman Adventures is fabulous. Each episode has its own page, so you can learn the story behind the story, so to speak. In addition, you can see pictures of some of the Brinkman kids such as Kitri and Ian. There are also additional video clips and printable images for some of the episodes. The Brinkman Adventures can help you and your children to experience adventure and learn about different cultures and geographic areas. In addition, the things you learn will be enveloped in a wholesome family story with the message of God’s divine providence. If this sounds good, The Brinkman Adventures may be perfect for you and your kids.